The engagement layer is at the point where you and your constituents interact. This is your website/CMS, social media presence, and other communication channels such as phone, mail and email. The analytics layer is represented at the center of the CRM environment be- cause it can incorporate data from any part of the organization. here’s where you make sense of the information you collect on your constituents and inter- actions. It is the thinking engine of your CRM strategy and may include business intelligence tools, segmentation engine and other dashboards and reports. 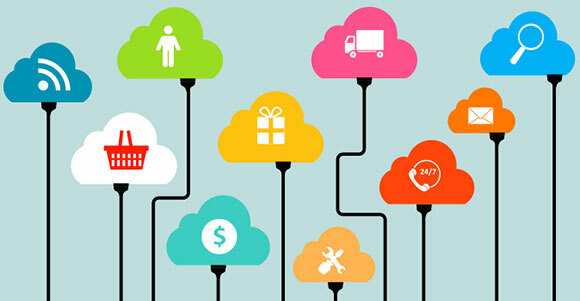 The operations layer is also known as your primary “database(s) of record.” This is what is most often referred to as CRM, though is actually really just one piece of it. This is where you organize interactions, collect history, record financial transactions and manage your day-to-day strategy. 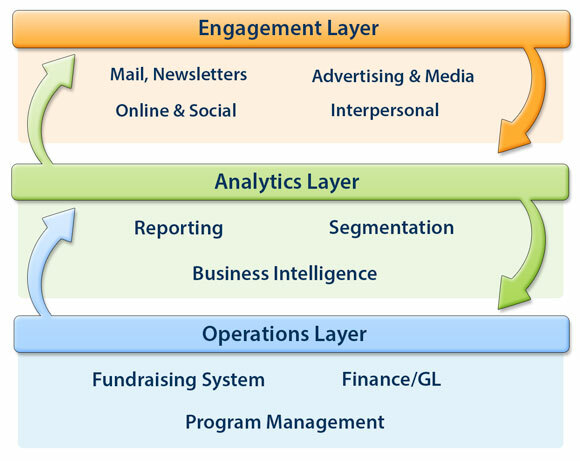 An effective CRM strategy connects each of these layers so you can continuously hone and improve how you connect with your constituents, improve their experience and expand your impact. The components that comprise each layer will change over time. That’s to be expected, given the ever-changing landscape of new tactics and new technologies. When these layers are working together, they create something greater than the sum of their parts – that’s when your organization can fully leverage your data to make decisions that drive growth and success according to your strategies.